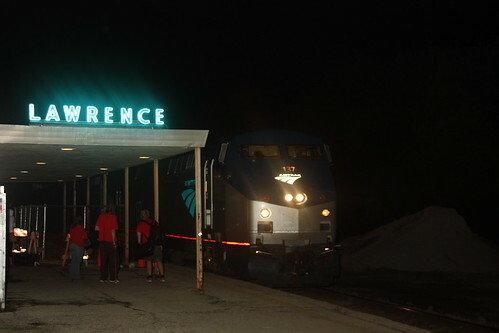 Saturday morning, I woke up early to open the Lawrence Depot and Greet the eastbound Southwest Chief, as I have occasionally done as a volunteer. It was the first time since the new signs were installed and turned on that I had done so. After the train left and the lights were turned off, I headed to Pomona, on the BNSF line in Franklin County. At that location, I saw a whopping 10 trains in all, including 8 trains during the 8 O’clock hour. I did not get a good pic of two of the trains, but I was able to snag shots of the other 8, plus Saturday’s Chief at Lawrence.